As always when we lose, the absolute last thing in the world I want to do it write a report about it. So I'm not going to. This decision was also facilitated by the fact I didn't go to the game, nor did I watch it on the box. Alas to say, we blew our chance to move into the top five and open up some space between us and the many teams on or around 20 points in midtable. Good to see Johnsen on the score sheet again, but our fourth defeat this season is still a bitter pill to take, especially after our recent good run. It is only our fourth loss this year, mind you. Only four other teams have lost less, and they're in the top four positions, so let's keep things in perspective. Next up is Kyoto on S-Pulse's official birthday - July 4th. 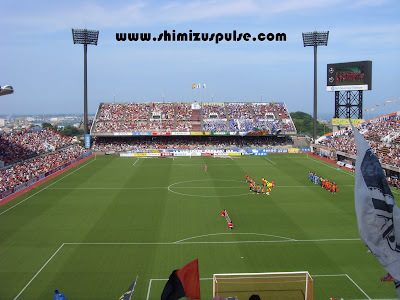 17 years ago to the day we played our first ever game (away to Gamba Osaka), and if we can avoid defeat next week, that'll be a year unbeaten at home in the league. It's surprising to think we've not fallen to defeat at home since Kobe turned us over last summer, but it's true, and should we overcome Sanga, 16 home league games unbeaten is something worth celebrating. Come on then boys, let's make it a round 16, and a full year! Highlights to come as soon as I find them online. Click here for some official club photos from the game (top row). What a glorious day to be an S-Pulse fan! Within ten minutes of the start, Yamagata's hardy travelling contingent must have been wondering why they bothered. 2-0 down to two admittedly slightly fortunate goals, they must have realised by then that it wasn't going to be their day. Our first came from Hara who made no mistake in dispatching the ball into the net after a poor defensive error from the Montedio number three, Leonard. 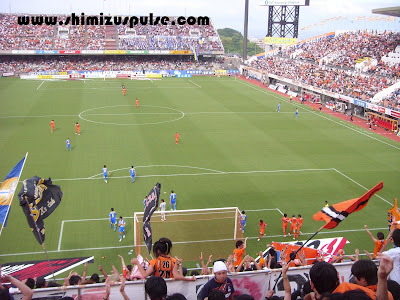 The lead was doubled just four minutes later when a half cleared ball fell to the recalled Ichikawa. He slammed it back in to the area. Was it a cross? Was it a shot? Who knows! All history will recall is that it took not one, but two deflections on it's was goalward, and ended up in the back of the net. Not surprisingly, it went down as an own goal. For the rest of the first half we looked the more threatening team, but didn't really look like extending our lead. The next goal came within a minute of the restart, when Montedio burst down the left wing, floated a perfect ball to the far post, and due to the lack of defensive positioning, was slammed home by the blue and white attacker. A banner urging us to sing up. "Silence is Prohibited"
At 2-1 with half the game to go, it could have swung either way. Lucky for us, we have a striker in some of the best form in the country. 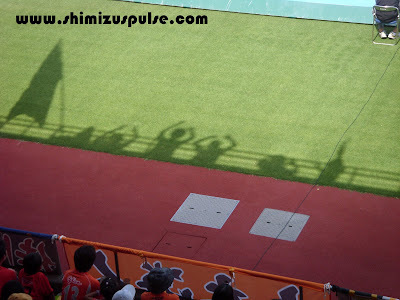 Fresh off the back of firing Japan to next year's World Cup, Okazaki was back in Shimizu and he didn't let us down. Five minutes after the Montedio goal, he took down a long ball from Iwashita on his chest, and it was with a classic Okachan finish that he smashed it home to make it 3-1 and push the game beyond the visitor's reach. We kept surging forward and looked increasingly dangerous and growing in confidence as the game went on. Ten minutes later, an unstoppable Hara run down the wing and an inch perfect cross into the danger area was met by Johnsen for another priceless goal from the big man. They're rarely pretty, but they all count, and we love him for it! Even after our fourth we weren't done, and were unlucky on a couple of occasions not to have grabbed a fifth. However, when we replaced Okazaki with Jungo and Johnsen with gangly youngster Nagasawa (why not Genki, Kenta?) our threat up from was gone at a stroke, and we just ran the clock down. But let's not be greedy; it was our third league win on the spin and was a great confidence building exercise in front of excellent home crowd. We're up to fifth and a whisker away from the ACL positions. The defeat for the visitors, their heaviest since joining J1, leaves them without a win in six and drops them down to 15th. After their early season heroics, the reality of a long hard season seems to have arrived, and unless they can string a couple of results together, they'll be staring down the barrel of a relegation battle. Official Pictures here. 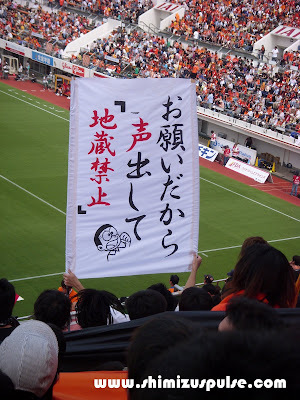 Read The Rising Sun's report on this, and all the other J1 matches this weekend, here. Includes full league table. 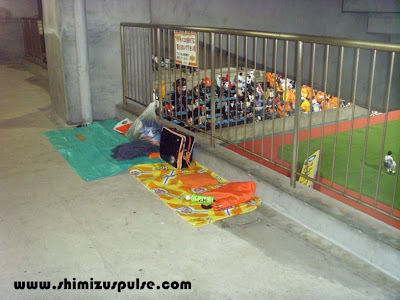 A makeshift team of reserves and players out of position fell 3-1 away to FC Tokyo today. It means we finish in 2nd place in the league cup group B. Omae Genki scored his first goal for the full team, which was good to see. We progress to the knock out stages and will face Urawa Red Diamonds home and away for a semi final tie against either Nagoya or today's foes, FC Tokyo. The 2nd leg at home is always a bonus, so lets hope we can put in a good performance in Saitama before bringing it back to 'Daira. Click here for some official snaps of the game. 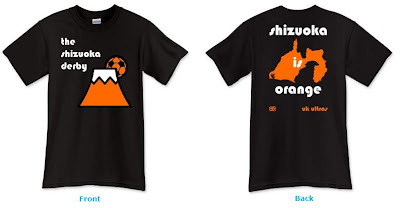 Shizuoka is Orange T-Shirt - now on sale! Yeah, yeah, I know the derby isn't until August, but why wait till then to get yourself in the mood? I recently knocked up a new t-shirt to accompany the original UK Ultras shirt which can now be seen donned by various people at any given game. 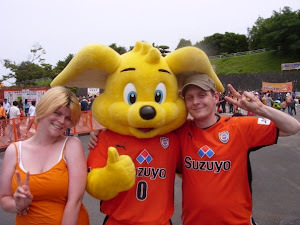 So to add to the above, I'm proud to unveil the new SHIZUOKA IS ORANGE shirt. 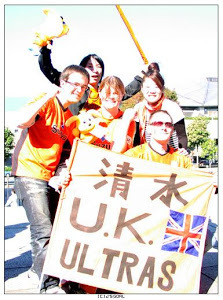 With an original Shizuoka Derby logo on the front, and the all orange map of Shizuoka Prefecture on the back, you can at once display your pride in all things S-Pulse and demonstrate your stone-willed refusal to accept the legitimacy of J****o's existence. This is available in regular and women's sizes. Click the image, or click here, to be whisked off to our online shop, where with just a few clicks (and your credit card number) you can purchase this year's hottest item. Shirts are by Printfection and are produced in, and shipped from, the USA. This means all prices are in dollars. Click here for a handy currency converter. Happy shopping! 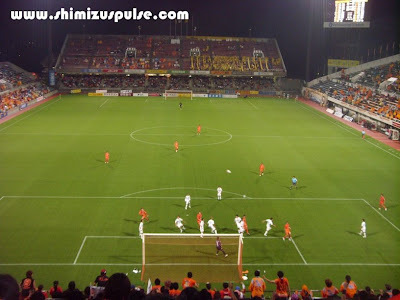 S-Pa v Yamagata Tickets Going Fast! 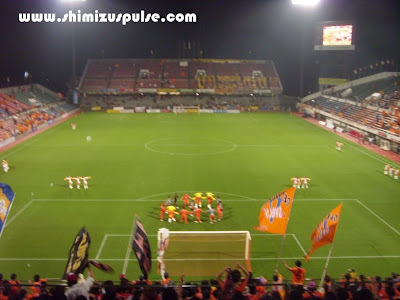 While I'm here, I should mention that tickets are selling well for next Saturday's clash with Yamagata. Only around 4000 are left with nearly two weeks to go, so don't leave it late - grab yours today. With five wins from six, and four victories on the bounce (three on the road) we're showing some good form, so don't miss out on the glory! Need help getting tickets? Click here. Our route into the knock out stage is secured, and we're the first team in the country to manage it. Top work. :) I didn't see this one, so I just have the stats to go on. Tsujio gave a penalty away in the very first minute, but Hara made sure it was all square before the break. The big man Johnsen grabbed a winner on 77, but picked up a second yellow card seven minutes later to gain his first red card since joining us. The result means we're through to round two and, depending on how we go against Tokyo on Saturday, will face either Nagoya or the winner of Group A in the quarter final. This could still be any one of Yokohama, Hiroshima or Urawa, but it won't be Little Jubilo, as they were knocked out last week. The quarter finals are scheduled to take place in July on the 15th and 29th, both Wednesday. A video from YouTube user SPKDF4 amongst the travelling hordes prior to kick off. As ever, they did their team proud! A personal cam captures the first two minutes, including kick off and the Kobe penalty. From the same uploader, Johnsen's winner, including full build up. Some official pictures from the game can be found here (top row). In other news, Okazaki was the nation's hero last night, as Japan won away at Uzbekistan and became the first team to qualify for the 2010 World Cup. Okachan scored the only goal of the night in the ninth minute. Looking forward to him continuing this form when he returns from his national team heroics! Place of our first win of the season back in March, it's back to Kobe we head with the goal of securing our spot in the second round of the League Cup. If we can win, and other results go our way, we'll be through. Okazaki is away with the national team, Nagai and M. Yamamoto are injured, but apart from that it'll probably be much the same team who beat Chiba midweek. As for those two injuries, Nagai is out for a month, and Masaki is out for six weeks. Neither should impact too much on our starting eleven over the next few games. Nagai is still yet to score, and Masaki has been played ahead of the likes of Edamura, Teru, Paulo, Jungo etc etc, so any one of them can more than ably step in. Three points, and with FC Tokyo beating Yamagata, it's means we can possibly clinch our place in round two with a win away at Kobe on Sunday. A plus 10000 crowd for a midweek Nabisco Cup game for the first time in nearly a decade - brilliant work from the S-Pulse massive, and it was a pretty entertaining affair, all told. We lost Masaki to injury just three minutes in, but Honda stepped up and did an excellent job in his stead. Hara opened the scoring on 19 minutes with a great finish from a Jungo through ball. It's his first goal for a while, so will do his confidence the world of good. 70 minutes later Johnsen pulled a ball back for a free and advancing Hyodo who, to my surprise, didn't smash it out the stadium, instead he drove a low, hard and sweetly struck shot past the keeper into the back of the net. Leaving stuff unattended for the entire game isn't uncommon. It wouldn't happen in Liverpool! Shortly after that, Chiba pulled one back, but nobody really noticed, and it was soon all over. 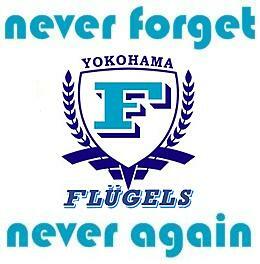 Let's do the business on Sunday and give ourselves a stress-free final match day against Tokyo in a fortnight. Extended highlights courtesy of You Tube user imoimo9's personal cam.